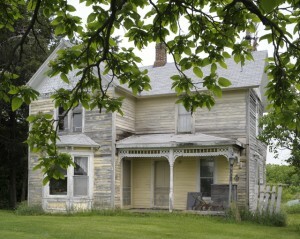 I left Maquoketa this morning and quickly found a deteriorating farmhouse, included here. The gnats were tormenting me again so I worked as quickly as possible. 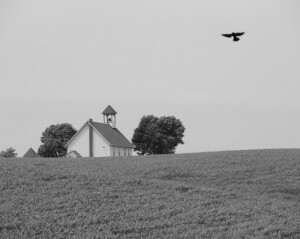 The church rising from the hill made a nice frame for the red-winged blackbird swooping by in the foreground. I stopped for lunch at a favorite restaurant in Iowa City (Z’Mariks Noodle Cafe) and walked around town in the strong but comfortable breeze (and to get another Starbucks iced coffee). Drove west on I-80 for a while but lost interest with the interstate as I usually do here, and drove the rest of the way to Grinnell on Highway 6. 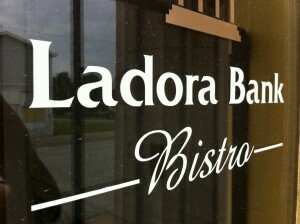 Stopped at the Ladora Bank (that I first photographed in 2004 prior to its rebirth) hoping to find that the bistro there was still in business – and it is. I arrived at my friend’s house outside of Grinnell and settled in. This has been my base in Iowa for all my trips since 2005. It will be nice not to unload all my gear each night only to return it to the car in the morning. 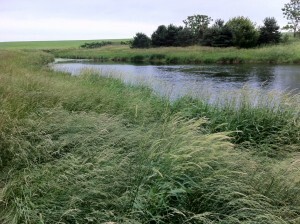 We took a drive to the pond hidden back in the cornfields surrounding the farm and fished for bass and sunfish. I came up with an empty hook, but others with me did much better! I also learned this evening that applying vanilla (as in extract) will keep the gnats away. I haven’t tried it yet, but I will as soon as the gnats figure out where I’m hiding. I arrived at my friend’s house – my base in Iowa – outside of Grinnell and settled in.